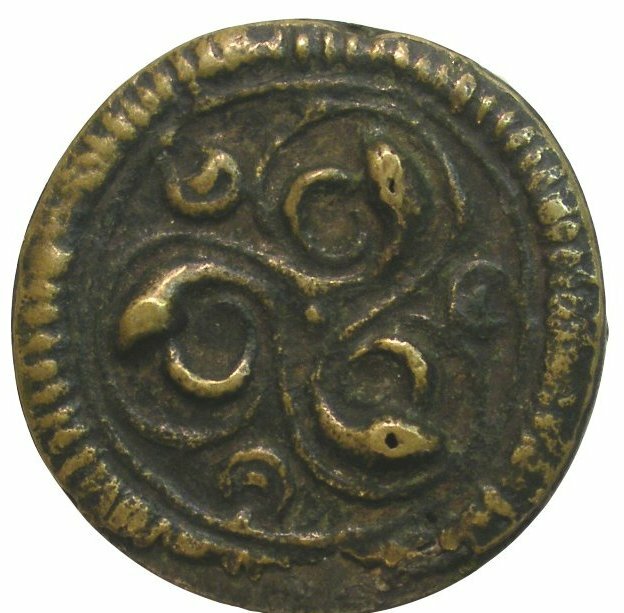 Today I present for your delectation three lovely ‘celtic’ bronze brooches, all of which were unearthed at Brough in eastern Cumbria. They are officially ‘romano-British’1 which means that they date to the four hundred years after the roman invasion, but archaeology suggests that they are the products of a bronze workshop on this site in the 2nd century CE2. 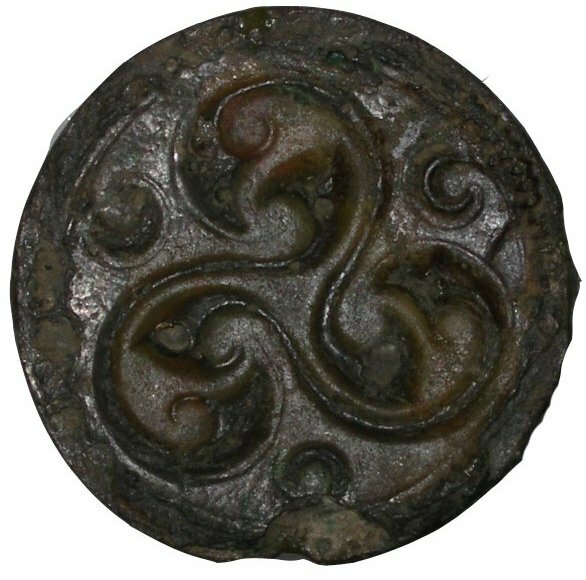 All three ‘celtic’ brooches feature what we shall, for convenience, describe as a triskele pattern. Three-fold circular patterns are a motif often seen in Europe from prehistory through to the late anglo-saxon period. An early example is the 3,000-year-old carvings on the entrance stone to Newgrange in Ireland – a magical place aligned so that the first rays of the rising sun enter the main chamber at the midwinter solstice – albeit these examples are a continuous circle; if you were drawing it, the last stroke of your pencil would join up with the first. The second triskele brooch was both tinned and enamelled, so it would have been silver in appearance, with coloured additions. The third example is the most damaged, and a ‘true’ triskele as the three ‘arms’ are joined at the centre. We have no historical source for the meaning of the triskele symbol, despite its long popularity. It may have been popular with celtic peoples but it was in use long before they adopted it. At the Newgrange burial chamber, it’s easy to imagine that its version of the triskele, with no beginning and no end, was about eternal life and the unending cycle of the sun moving around the earth. Celtic culture was fond of triplicity in many forms, with examples of matronae, or triple mother goddesses, found throughout western Europe during the roman empire. There may have been triple gods, too; Teutates (tribal father), Esus and Taranis (thunderer)3 were associated with 1st century celts, and genii cuculatti (hooded spirits) tend to be portrayed in threes in Britain in the period in which the brooches were made. These were followed (in written form, at least) by the triple forms of the Irish Brigid and Morrigan. There’s always the possibility, of course, that it was just an attractive design but we 21st-century folks can’t resist adding ‘ritual’ meaning to them. Until we find the 1800-year-old bronze-worker’s manual, we’re just guessing. I’d still like one, though. 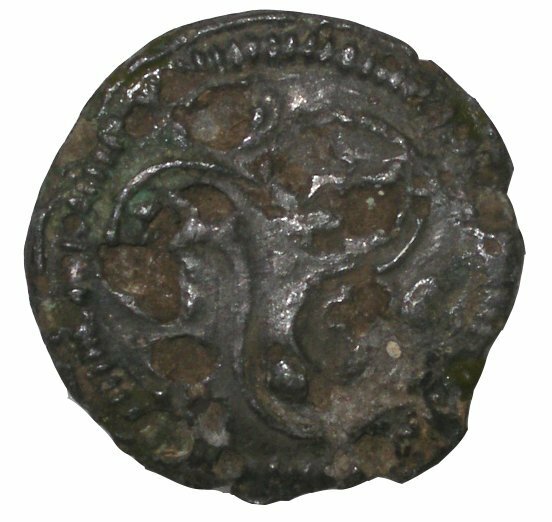 This entry was posted in Folklore: Magical, History of Cumbria, History: Pre-Roman gods and goddesses, History: Roman, History: Unburied treasure and tagged brooch, brough, celtic, cumbrian history, penannular, romano-british, triplicity, triskele, triskellion, verteris. Bookmark the permalink. Great stuff Esmeralda, thanks. The A66 is still a splendid approach route into Cumbria, isn’t it! Nice to see you, oh Celtic One! I think your theory about turning suns may well be correct – so many of these very early symbols are sun ones, and it fits rather well with Newgrange! We might just have got confused with later Celtic ideas about triplicity. Let’s face it, another well-known ancient sun symbol has four arms, doesn’t it? Another fascinating trip down a Cumbrian by-way, thanks! It’s a shame the BM entry doesn’t seem to give any context for the finds which might shed light on their purpose (other than as brooches, of course!). The finds catalogue number seems to suggest a 1902 addition; maybe they were casual discoveries as the only reference is to a 2004 overview of brooches. Yes, that warehouse! They’re dangerous places, aren’t they!